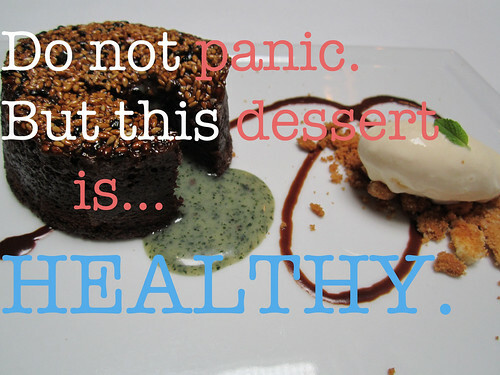 Do not panic...but this dessert is somewhat healthy. I recently received a press release touting the immunity-boosting benefits of this sweet treat, created by Master Chef Helene An, of Crustacean Restaurant Beverly Hills. Chef An is pretty interesting: she studied Eastern Medicine in her native Vietnam and has incorporated its principles in her cuisine. All of her dishes feature herbs specific to health concerns along with strengthening the immune system. The dish was created for Valentine's Day, when An decided "she decided to feature her favorite herb, Tiato, in creating her Chocolate Souffle Cake. The Tiato herb (a Vietnamese mint) increases circulation and facilitates digestion and adds a unique mint flavor to the cake. Here is the recipe that I hope will spark your interest. " 1. To make the truffles: combine the white chocolate, butter, cream, and salt in a double boiler or in a heatproof bowl set over a saucepan of gently simmering water and heat, stirring occasionally, until the chocolate and butter are completely melted and smooth. Whisk in tiato powder and brandy. Transfer the ganache to a shallow dish and refrigerate, uncovered, until firm. 2. When the ganache is almost set, make the chocolate cakes: Preheat the oven to 425 degrees F. Generously butter and flour eight 4- ounce ramekins and set aside. 3. Melt the butter and chocolate in a double boiler or in a heat proof bowl set over a saucepan of gently simmering water, stirring occasionally, until completely melted and smooth. Remove from the heat. 4. Put the yolks, salt, and half the sugar in a large mixing bowl and whisk just until blended. Add the melted chocolate mixture, whish well, and set aside. 5. Put the egg whites in the bowl of an electric mixer fitted with the whisk attachment and whisk at medium-high speed until frothy. With the machine running, slowly add the remaining sugar and continue whisking until medium peaks form. 6. Whisk half the whites into the yolk mixture until fully incorporated, and then gently fold in the remaining whites. Divide the batter evenly among the ramekins. 7. Use a 1-inch diameter ice cream scoop or a measuring spoon to scoop the white chocolate mixture into eight 1-inch balls. Press a ball into the center of each ramekin and use the back of a spoon to a smooth the batter over the truffle until it is covered. 8. Bake until the cakes are a dark chocolaty brown and dry to touch, about 7 minutes; they should have risen about ? an inch above the rim of the ramekins. Cool for 1 minute in the ramekins, then invert onto serving plates and serve.